Landlords – Do you rent a property that is lived in by 5 or more people from 2 or more families? 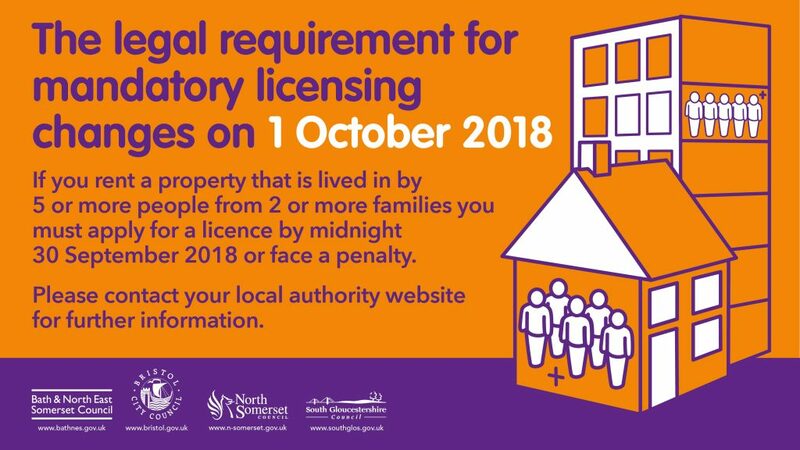 If so, regardless of how many floors the property has, you have until midnight 30th September 2018 to apply for a HMO Licence (if you haven’t done so already). Unfortunately, due to the constraints of GDPR and having taken legal advice we are no longer able to operate a form 77 service. We apologise to all form of contributors and thank them for their past submissions. The government has published a ‘How to Let’ guide for landlords. It’s a great guide to read through to ensure that you have carried out all of your landlord responsibilities. Please note. The booklet does not cover leasehold, holiday lets or resident landlords who let to lodgers. This guidance document will help landlords understand how health and safety rules for shared houses will impact their properties. From 1st October 2018, private landlords renting out a property to 5 or more tenants from two or more separate households must have a licence from the local authority. The aim is to protect tenants from poor and often over crowded living conditions owned by a small number of landlords. We want to support good private landlords who provide decent well-maintained homes and not impose unnecessary regulation. Mandatory licensing of HMOs came into force in 2006 and originally applied to properties of three storeys or more with five or more people making up two or more separate households living in them. As demand for HMOs increased in the decade since mandatory licensing was first introduced there has been a significant increase in properties with fewer than three storeys being used as HMO accommodation, notably two storey houses originally designed for families and flats. Some have been used by opportunist rogue landlords who exploit their vulnerable tenants, and rent sub-standard, overcrowded and potentially dangerous accommodation. The growth of HMOs has also had an impact on the local community, including where inadequate rubbish storage leads to pest infestation and health and safety problems. To this end we have also clarified the minimum size to be applied to rooms used for sleeping accommodation in HMOs and added requirements relating to the provision of refuse disposal in licensed properties. The measures complement those in the Housing and Planning Act 2016 which tackle rogue landlords. They will also operate within the additions brought in by that Act to the enforcement regime, including the financial penalty procedures and banning orders. What are the extended mandatory HMO licensing requirements? In April 2018, Parliament approved secondary legislation which reforms the mandatory HMO licensing regime. The Licensing of Houses in Multiple Occupation (Prescribed Description) (England) Order 20182 (‘the Prescribed Description Order 2018’) has the effect of extending the scope of section 55(2)(a) of the Housing Act 2004 (‘the Act’), so that mandatory HMO licensing also applies to HMO properties which are less than three storeys high. The Prescribed Description Order 2018 also deals with the passporting of licences granted under additional and selective licensing schemes into the mandatory licensing regime. From 1 October 2018 local housing authorities must impose conditions as to the minimum room size which may be occupied as sleeping accommodation in the HMO. A room smaller than the specified size must not be used as sleeping accommodation, and communal space in other parts of the HMO cannot be used to compensate for rooms smaller than the prescribed minimum. The purpose of this condition is to reduce overcrowding in smaller HMOs. The standards adopted are similar, but not identical to, those relating to overcrowding in dwellings under section 326 of the Housing Act 1985. What is the minimum sleeping room size? The minimum size for sleeping accommodation does not apply to charities providing night shelters or temporary accommodation for people suffering or recovering from drug or alcohol abuse or mental disorders. It will also be a mandatory condition that any room of less than 4.64 m2 may not be used as sleeping accommodation and the landlord will need to notify the local housing authority of any room in the HMO with a floor area of less than 4.64 m2. Any area of the room in which the ceiling height is less than 1.5m cannot be counted towards the minimum room size. In addition, local housing authorities are required to impose conditions specifying the maximum number of persons over 10 years of age and/or persons under 10 years of age who may occupy specified rooms provided in HMOs for sleeping accommodation. The mandatory room size conditions will however be the statutory minimum and are not intended to be the optimal room size. Local housing authorities will continue to have discretion to set their own higher standards within licence conditions, but must not set lower standards. All licences issued after 1 of October 2018 will need to include a condition requiring the compliance with the council’s storage and waste disposal scheme (if one exists). A licence holder’s failure to comply with the scheme is a breach of the licence and a criminal offence. From 1 October 2018, local authorities will be required to impose a mandatory condition concerning the provision of suitable refuse storage facilities for HMOs. Local authorities will be aware that HMOs, occupied by separate and multiple households, generate more waste and rubbish than single family homes. Some local authorities have made specific provision under their function as the local waste authority for landlords of HMOs to ensure there are appropriate facilities for storing rubbish their properties generate. All licensed HMOs will need to comply with the scheme issued by the local authority (if one exists) for the storage and disposal of domestic refuse pending collection. A licence holder’s failure to comply with the scheme is a breach of the licence and a criminal offence. This condition must be included in all HMO licences (mandatory or additional) granted or renewed after commencement of the Mandatory Conditions Regulations 2018 on 1 October 2018. For more information and detail, please see the publication via the link above.